Costing $295USD on Amazon, Pimsleur Cantonese comprises of 30 x 30min lessons teaching Cantonese solely through listening, repeating then anticipating responses. The course claims upon completion of Pimsleur Comprehensive Level I Program (30 lessons), you will have achieved spoken-language communication skills at an Intermediate-Low Level including the ability to participate in simple, direct conversations, etc. When I started to learn Cantonese, I listened to 30 lessons (each 3 times per day for a month - I could understand 100% of the course), I truly believed that I gained an Intermediate-Low level speaking ability which was exaggerated on nearly every website on the Internet. The course is good in theory but in reality it caused my Cantonese confidence to be quickly crushed. Having learnt the 100 words that Pimsleur teached surely cannot classify my level as Intermediate-Low at that point of time. Attempting to say something lead to abruptly stopping on every 2nd word with “What did you say? I don’t understand”. This rendered every native speaker to quickly switch to English. Even parroting one of the pre-defined sentences to a native speaker always caused me to panic when I heard a response that varied to one that was taught. I now realise that having a conversation that won’t lead to “what does this mean?” in every response; requires thousands of words in your spoken vocabulary. There is nothing magical about a quick-fix course teaching 100 words over a 1 month period costing $3 per word. I can honestly say don’t expect any miracles or have any functional ability from Pimsleur Cantonese. Yes, I, too find that as I’m going through them. What do you use in order to improve your vocabulary? Do i need to purchase the Pimsleur for me to be able to converse. I agree that Pimsleur is way to expensive for what it offers. I am learning Mandarin and I’m now at the seventh lesson of Pimsleur Mandarin III. I guess at the end of Pimsleur Madarin III I should be at a low-intermediate level…and I am using other texts too. The good news is that you can download the Pimsleur programme for free with a torrent client, so why pay the hefty price? Talking of torrents, you can also download tv series. They are less of a commitment than a movie, and through the many episodes you can get used to individual speakers, and the repeating theme and vocabulary. It does help me a lot, also I know I am listening to natural speech, which you won’t get in any language learning programme, sad but true. Lastly, I find that the best way is to have some chatting partners with whom you can comfortably put into practice what you have worked so hard on at the end of the day and enjoy. With a little searching, you will easily find someone who is patient and helpful enough. Hope this helps. Whoops, I just started the Pimsleur lessons (up to lesson 6) so I’m a little sad to see they didn’t help you much. At least I’m not relying on them alone, I’ve got some other materials as well. And at least I, ahem, didn’t pay for them. Thanks for the heads up. I found mp3 in Lonely Planet:Cantonese very useful for beginners. I used them. Pimsleur Cantonese I found difficult because my english poor, but I continue to listen it. Perhaps you have texts (scripts) for Pimsleur Cantonese? Can you send me? 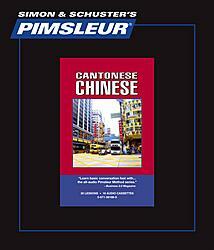 I have found that Pimsleur Cantonese is the best there is, for me anyway. It truely requires very little time. Yes, you will get lost easy when conversing with a native speaker but that is not Pimsleur’s fault. That is just the way it is. I’ve impressed quite a few local speakers just from what I have learned from those 30 Pimsleur lessons. I wish they had another 30 lessons or a part 2 if you will! I would like to go further with my Cantonese and I really prefer their approach. 1) I never pay full price. I don’t condone stealing it, but there is a site called Pimsleur Marketplace (I’ll let you Google it in lieu of sounding like a spokesperson for them) that sells used copies for a little over $100, then offers to buy them back from you for $100, so it only ends up costing me like $5-$25 per language. That’s pretty decent, and I get to feel good about myself for not pirating. 2) Any language is going to take an investment of time. 15 hours (or 30 or even 45 if you repeat the lessons) isn’t going to get anyone very fluent, but in my experience 15 hours of Pimsleur beats any other 15 hours I could have spent learning a language. Even my shallow understanding of the languages has given me confidence when traveling and has laid a foundation that helps me pick up more of the language through exposure than I would have otherwise. Also, putting forth an effort to attempt the native language I feel like is the least I can do, and in many cases it seems to be appreciated by the people I meet… usually a couple seconds before the person switches to speaking English for me (which I also appreciate). Really? Thats ( 30 x 30 mins ) x 3 = 45 hours a day. Hi there, I’m currently up to Lesson 7 on the Pimsleur cantonese program. I bought the 1st 16 lessons on ebay. Thanks for your review as I have more realistic expectations of what I will achieve at the end of these lessons. On the positive side of Pimsleur, I’ve always had great difficulty with Mandarin and cantonese because of the different tones involved. I think that short of having a native speaker speak to you everyday, the CDs really help with tones. And I really like how the limited vocab I learn I actually remember. Hey Dave, I think the little dragon means one lesson a day as recommended, and each one listen to 3x that day. I think Pimsleur is a great method. All I could afford is the basic set, and I’ve learned alot from it. Much of my vocabulary has come from other sources though. My problem with Pimsleur is that it’s priced as if this is the one thing the learner has to buy in order to become fluent. Let’s be honest, no one is ever going to be fluent after only 15 hours of studying a language. However, if you were in Hong Kong, could you at least communicate at a basic level with someone who doesn’t speak English? That’s the main question. The Pimsleur method does work; it’s just that you need far more than just those thirty lessons to even be moderately proficient in the language. Every day, you should (ideally - it may not be possible but at least try for half an hour) watch a movie in Cantonese, if you can. Don’t expect to understand it (and in fact feel free to leave the subtitles on), but understanding it isn’t the point. The point is getting used to hearing the language spoken at full speed - something that you can only get by listening to the radio and watching tv. Then, find a friend who speaks the language. The basics you’ve learned from Pimsleur should give you enough to be able to hold very basic conversations, and your friend should be able to teach you more vocabulary. After fifteen hours, you should have gotten the hang of of the tones, and if you have a decent friend, they should hopefully be patient enough to let you practice saying the new words they teach you. In fact, the conversation is more important than the listening - gaining the confidence to speak the language is the hardest part. And occasionally talk to strangers. They’ll often be happy that you’re making the effort and won’t mind the occasional mistake. Don’t worry about being fluent - very few people are truly fluent in their second language - and don’t worry about not understanding what people say - the worst that can happen is that you have to ask them to repeat themselves slower, or what a word is in your native tongue. In the case of Cantonese, try ordering your chinese takeaway in Cantonese (chances are it’ll be the first language of the person taking the order). Eventually you’ll have to ask to speak in English, but as your vocabulary increases, you’ll find that you can hold more and more of a conversation in Cantonese. Above all else, remember that all this is theoretical, and your mileage may vary. Learning a language can be fun, if you let it be fun, but it is hard work and takes time - like learning any skill worth having. Pimsleur is a good starting point, and it is very, very good at being a starting, but that’s all it is.